Sources: U.S. Public Health Service Municipal Wastewater Inventories and USEPA Clean Water Needs Surveys. Notes: Less than secondary facilities = Primary + advanced primary; Greater than secondary facilities = Advanced secondary + advanced treatment; No discharge = Facilities that do not discharge effluent to surface waters. Data Sources and Calculations The USEPA Clean Water Needs Surveys were the primary data source used to estimate the nationwide rate of influent CBOD5 loading to POTWs. Actual influent CBOD5 loading data were reported for 1978, 1980, 1982, 1984, and 1986. For the years for which data were not available, per capita influent loading was assumed to be 0.296 lb CBOD5 per person per day. This rate was based on an estimated constant normalized flow rate of 165 gpcd and an influent CBOD5 concentration of 215 mg/L. The use of 215 mg/L as the influent CBOD5 concentration is consistent with several other estimates of raw wastewater strength (e.g., AMSA, 1997; Tetra Tech, 1999; Metcalf and Eddy, 1991). It also is the mean nationally aggregated ratio of the total influent CBOD5 loading rate normalized to total wastewater flow reported in the USEPA Clean Water Needs Surveys for the 5 years that actual wastewater flow data were reported (range from 209 to 229 mg/L). Sources of influent BOD include residential, commercial and industrial, and infiltration and inflow contributions. Some readers might note that an influent loading rate of 0.296 lb CBOD5 per person per day is almost twice the typical "textbook" value of 0.17 lb CBOD5 per person per day, sometimes referred to as the "population equivalent" (PE) loading rate. Textbook values, however, usually account for only the average per capita residential load contributed by combined stormwater and domestic wastewater. The industrial and commercial components are excluded (see Fair et al., 1971). To provide a more complete characterization of influent BOD loading inclusive of all sources, the higher figure was used in this study. where the multiplier factor of 1.2 is the CBODu:CBOD5 ratio associated with raw wastewater. Trends in Influent CBOD5 and BODu Loading to POTWs Figure 2-10 is a column chart that compares total influent CBOD5 and BODu loading from 1940 to 1996. Figures 2-11 (a) and (b) display influent CBOD5 and BODu loading data, respectively, organized by wastewater treatment type. Influent BOD loading to the nation's POTWs more than doubled from 1940 to 1996, reflecting population growth, increases in the number of facilities, and expanding service areas. 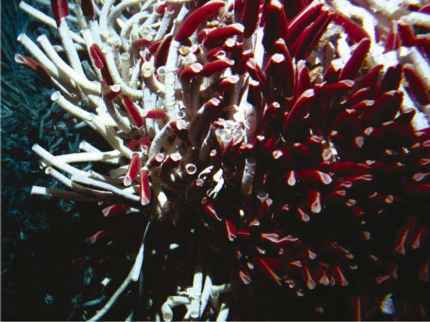 Figure 2-10 Total influent BODu and CBOD5 loading, 1940 to 1996. Sources: U.S. Public Health Service Municipal Wastewater Inventories and USEPA Clean Water Needs Surveys. 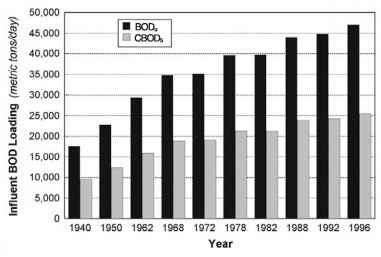 Figure 2-11 Influent loading of (a) CBOD5 and (b) BODu to POTWs nationwide for select years between 1940 and 1996 organized by wastewater treatment type. Sources: U.S. Public Health Service Municipal Wastewater Inventories and USEPA Clean Water Needs Surveys. 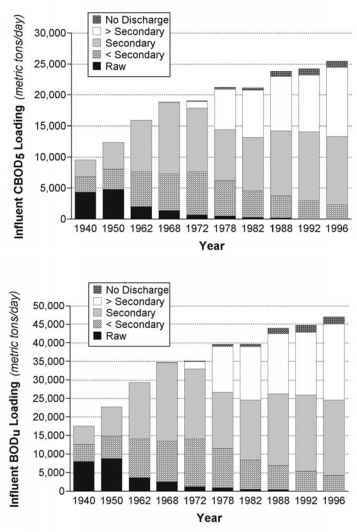 Influent CBOD5 loading increased from 9,508 mt/day in 1940 to 18,814 mt/day in 1968. By 1996, influent CBOD5 loading stood at 25,476 mt/day, a 35 percent increase from 1968. Influent BODu loading increased from 17,532 mt/day in 1940 to 34,693 mt/day in 1968. By 1996, influent BODu loading stood at 46,979 mt/day, a 35 percent increase from 1968. In 1940, 72 percent of influent BODu loading nationwide was being treated by facilities with less than secondary treatment (12,555 of 17,532 mt/day of BODu). By 1968, 39 percent of influent BODu loading nationwide was being treated by facilities with less than secondary treatment (13,422 of 34,693 mt/day of BODu). Twenty-four years after the 1972 CWA, only 9 percent of influent BODu loading was being treated by facilities with less than secondary treatment (4,254 of 46,979 mt/day of BODu). Table 2-7 presents nationwide effluent loading of CBOD5, CBODu, NBODu, and BODu organized by wastewater treatment type for select years from 1940 to 1996. Data Sources and Calculations Effluent CBOD5 loading rates were estimated based on influent CBOD5 loading rates and CBOD5 removal efficiencies (expressed as a percentage) associated with each type of municipal wastewater treatment (see Table 2-2). In keeping with the convention of combining primary and advanced primary treatment and designating the result as "less than secondary" treatment, CBOD5 removal efficiencies for these two categories were averaged to derive a "less than secondary" treatment removal efficiency of 42.5 percent. Likewise, CBOD5 removal efficiencies assigned to advanced secondary treatment (90 percent) and advanced wastewater treatment (95 percent) were averaged to derive a "greater than secondary" treatment removal efficiency of 92.5 percent. Table 2-8 presents CBOD5 removal efficiencies by municipal wastewater treatment type and corresponding effluent CBOD5 concentrations. Recall that the CBOD5 removal efficiencies used in this study are percentages typically assigned to NPDES permits according to the treatment process and POTW design assumptions (USEPA, 1978; Metcalf and Eddy, 1991). Use of "design-based" removal efficiencies may, in some cases, result in a conservative (i.e., high) estimate of effluent CBOD5 loading. USEPA's Clean Water Needs Surveys for the years 1976, 1978, and 1982, for example, report 41 and 64 percent CBOD5 removal efficiency for primary and advanced primary facilities, respectively. These same reports present removal efficiencies for secondary (82 to 86 percent), advanced secondary (89 to 92 percent), and advanced wastewater treatment (87 to 94 percent) either in the range or very near to the range of design-based removal efficiencies. The design-based CBOD5 removal efficiencies were chosen for use in this study over actual reported efficiencies because it was assumed that a conservative approach would provide a more effective and consistent comparison of trends for POTW BOD removal over the entire period of record analyzed.